Don’t confuse Joseph Massad with Mossad. Very different. Columbia University has a lot to answer for, but Joseph Massad, whom we wrote about here last year, has to be near the top of the list. Born in Jordan, he earned his Ph.D. at that New York institution and now holds a tenure-track position there. Nothing has halted his rise, and nothing has brought him down – even though he routinely says staggeringly ugly things about Jews, Israel, and America, and paints pictures of Jewish and Palestinian attitudes, and of the Israeli-Palestinian conflict, that are utterly unrecognizable to clear-eyed observers of the real world. For him, Jews and Israelis are always bigots and aggressors, America uniquely and almost exclusively imperialist, and Muslims and Arabs are consistently nothing more than innocent victims. But that’s only the beginning. Massad is one of those loathsome creatures who claim that it’s the Palestinians, not today’s Jews, who are the descendants of the ancient Hebrews. While erasing from history well-documented acts of Arab violence against Jews, he invents acts of Jewish anti-Muslim brutality. He has routinely equated Israel with Nazi Germany, described America as a primitive and barbaric sinkhole of “violent racism,” and whitewashed Islamic mistreatment of women while depicting the West as Ground Zero for misogyny. Whereas in fact Arab and Muslim leaders were friendly with Hitler and admired the Final Solution, Massad erases this history and invents a new one in which Zionist Jews were allied with the Nazis. Even though he’s gay, moreover, Massad approves of the abuse of gay people by Muslim individuals and governments, defending it on the grounds that homosexuality is a Western social construct and that Islamic authorities have the right to punish it vigorously in order to protect their culture and its values from being polluted by this alien form of immorality. Here, as throughout much of his oeuvre, Massad deep-sixes the systematic inculcation of Jew-hatred in Palestinian chilidren and the routine broadcasting by Palestinian media of blood libels, faked footage of non-existent IDF atrocities, etc. No, to believe him, the poisonous and irrational hatred for Jews that can be found among many people in Gaza and on the West Bank, and especially among Palestinian “leaders,” is merely a principled rejection of Zionism on the grounds that it is nothing more or less than a form of Western colonialism. Asked about Massad’s essay, Abraham Cooper of the Simon Wiesenthal Center dismissed him as “a denier of reality.” True enough. A writer at the Elder of Zion website also noticed that Massad, in the essay, played fast and loose with a quote from Winston Churchill in an effort to paint him as an anti-Semite. But so what? Massad is so far out there – so shameless a salesman of wholesale historical distortions – that it hardly makes sense to get very worked up at yet another Big Lie from this vile enemy not only of the Jews but of basic decency and truth itself. In the years since, Redgrave has remained a devout Marxist. In her 1994 autobiography, she wrote that she was still “absolutely convinced of the necessity of Marxism, and not for a single day has this conviction been shaken.” She’s also continued to be a generous supporter of Islamic terrorism. In 2002, she paid £50,000 bail for Akhmed Zakayev, a Chechen who was accused by the Russian government of involvement in terrorist acts, including that year’s Moscow theater hostage crisis; in 2007, she helped pay bail for a terrorist who’d been arrested immediately upon returning to Britain after his release from Guantánamo. Before I get on to the writing awards, there’s a little matter I’d like to tidy up – at least if I expect to live with myself tomorrow morning. I would like to say, personal opinion, of course, that I’m sick and tired of people exploiting the occasion of the Academy Awards for the propagation of their own personal political propaganda. I would like to suggest to Miss Redgrave that her winning an Academy Award is not a pivotal moment in history, does not require a proclamation, and a simple “thank you” would have sufficed. Chayevsky’s remarks about Redgrave were received by the audience with immense enthusiasm. (Among those who can be seen applauding lustily in the You Tube clip are Chayevsky’s fellow writers – and fellow Jews – Neil Simon and Arthur Laurents, the latter of whom had actually been a victim of the blacklist; conspicuously not applauding was Shirley MacLaine, whose own fondness for Communism we examined on this site in 2015.) In these times, however, when more and more Hollywood luminaries are loath to criticize Islamic terror but quick to demonize the only democracy in the Middle East, we can’t help but wonder how one of today’s Oscar audiences would respond to a speech like Redgrave’s and to comments like Chayevsky’s. But Red Ken is no longer every Labourite’s favorite socialist crank. In an interview with the BBC in April of last year, Livingstone stood up for Labour MP Naz Shah, who’d been suspended from the party for having written or reposted anti-Semitic material in Facebook. For example, she’d compared Israel to Nazi Germany and reposted a meme calling for Israel to be moved to the U.S. In her defense, Livingstone said: “Let’s remember, when Hitler won his election in 1932 his policy then was that Jews should be moved to Israel.” In other words, Hitler “was supporting Zionism.” Only later, according to Livingstone, did the Führer go “mad” and decide to exterminate the Jews of Europe. Seen from one perspective, the former mayor’s remarks were nothing new: as Richard Ferrer put it in the New Statesman, Red Ken has “made gratuitously antagonising Jews into an art form.” While serving as mayor, for example, Livingstone played host to Islamic religious scholar Yusuf al-Qaradawi, for whom rabid Jew-hatred is an inextricable part of his theology. Qaradawi, by the way, is also big on hating homosexuals, and when British gay-rights advocates protested Livingstone’s extremely gracious – in fact, downright friendly – treatment of Qaradawi, Livingstone shot back by calling them dirty Islamophobes. Yet even though Jews and gays tend to form an important part of the Labour Party base, especially in London, Livingstone somehow got away with all of this. He didn’t get away with his comments in defense of Naz Shah, however. Shortly after airing his curious rewrite of modern German history, Livingstone was fired from LBC (formerly the London Broadcasting Company), for which he had co-hosted a TV program for eight years. Not until this April did the Labour Party take up his case. After three days of deliberations, the party’s National Constitutional Committee declared his words about Jews “grossly detrimental,” but decided to suspend him from the party instead of expelling him outright. In the meantime, speaking to reporters, Livingstone made things even worse for himself, claiming that the Nazis had sold guns to Zionists before the war and that this amounted to a “real collaboration” between the two. When asked to apologize, he refused. These developments came at a bad time for Labour. Local elections will be held on May 4, and Labour’s prospects were already looking poor. And what a web they wove! A century ago, the Webbs, Sidney (1859-1947) and Beatrice (1858-1943), were the power couple of British Labour. Together they help form the Fabian Society, whose devotion to the idea of a socialist UK played a major role in shaping Labour Party policy and creating the modern British welfare state. They took part in the founding of the London School of Economics. They carried out research, published studies, and sat on committees, all with the goal of establishing an entirely new social and economic order. For a time Sidney was a Labour minister. “Together, we could move the world,” Sidney once said of their relationship. “Marriage is a partnership. It is the ultimate committee.” (That last sentence should give you a pretty good idea of how their minds worked.) The immense scale of their influence is undeniable; the merits of their efforts to alter the British system are subject to debate. Certainly much of what they helped to achieve was genuinely admirable. But the activity that capped off their careers can only be described as a world-class example of useful stoogery. We’re referring here to their promotion of Soviet Communism. The Webbs didn’t start out as admirers of the USSR. During the 1920s they recognized that Soviet Communism and Italian fascism were two sides of the same coin – and equally appalling. Had Eric Hobsbawm died 25 years ago, the obituaries would have described him as Britain’s most distinguished Marxist historian and would have left it more or less there. Yet by the time of his death…he had achieved a unique position in the country’s intellectual life…he became arguably Britain’s most respected historian of any kind….Both in his knowledge of historic detail and in his extraordinary powers of synthesis…he was unrivalled. No less fulsome was Hobsbawm’s New York Times obituary, by William Grimes, which overflowed with words like “masterwork,” “incisive,” “eloquent.” Nick Higham’s piece for the BBC website was equally fawning. As those last few sentences suggest, to be sure, there was one ticklish little fact about Hobsbawm: he was a lifelong Stalinist. Most of those who extolled him in the “respectable” media did acknowledge this detail, but they all found curious ways to, shall we say, diminish its importance. Higham, indeed, referred neutrally and without irony to Hobsbawm’s “Marxist ideals” (can one imagine a writer for the BBC ever citing in this way someone’s “Nazi ideals”?) and quoted then Labour Party leader Ed Miliband’s praise for Hobsbawm as “an extraordinary historian, a man passionate about his politics and a great friend of his family” and as a man who “cared deeply about the political direction of the country.” Kettle and Wedderburn, for their part, even saw Hobsbowm as a victim – a man whose university career was hampered by “a very British academic McCarthyism” (read: a disinclination to allow a Stalinist to indoctrinate students). George Galloway, king of the stooges? When Naz Shah, a Labour Party politician who represents Bradford West in Parliament, stood up last year to make her first speech to her fellow MPs, she broke with the custom of praising her immediate predecessor. And with good reason. That predecessor was George Galloway – a man only a creep would eulogize. To be sure, because of his outsized personality, colorful language, rich Scottish brogue, and constant bluster, it’s tempting to dismiss him as a cartoon version of a useful stooge, someone who’s simply too far out there to take seriously. As columnist Nick Cohen wrote recently, too many Brits have viewed Galloway indulgently as “a character,” a lovable clown who, whatever his foibles, is at least “passionate about his beliefs,” instead of being one of those “poll-driven, focus-group–tested on-message politicians, who speak in soundbites.” For years, complained Cohen, “Galloway was treated with an indulgence that, like a cardiogram, revealed the sicknesses at the heart of the liberal-left.” Sickness? Yes, because any man who’s enjoyed as much power and support as Galloway has, and who’s been such a faithful lapdog for the very worst of totalitarian tyrants, should be taken very seriously indeed. Galloway makes most other useful stooges look like half-hearted amateurs; he could give courses in licking the boots of international bullies, and in demonizing the virtuous and free. Now sixty-one years old, Galloway was first elected to Parliament from Glasgow in 1987. In 2003, he was kicked out of Labour for supporting jihad against his own country’s troops and for championing the Baath Party “resistance” against the U.S.-led invasion of Iraq. He then joined Respect – the Unity Coalition (later simply called the Respect Party) – described by Cohen as an “alliance… between the Trotskyist far left and the Islamic far right” and by Christopher Hitchens as an example of “[t]he servants of the one god finally meet[ing] the votaries of the one-party state” – and was sent back to Westminster as MP for the London neighborhood of Bethnal Green (which is 50% Muslim) and, later, beginning in 2012, for West Bradford (also heavily Muslim) in Lancashire. In 2012, the Islamic Forum of Europe and Muslim Public Affairs Committee both took part in Galloway’s re-election campaign. Galloway publicly questioned the orthodoxy of the Muslim Labour candidate, Imran Hussain, telling “all the Muslim brothers and sisters” in his district that he himself was a teetotaler and wondering aloud whether that was true of Hussain. “I’m a better Pakistani than he will ever be,” Galloway told one audience. “God knows who’s a Muslim and who is not. And a man that’s never out of the pub shouldn’t be going around telling people you should vote for him because he’s a Muslim.” In 2015, Galloway went even lower, despicably accusing his Labour opponent, Naz Shah, of lying about having been subjected to a forced marriage when she was a girl in Pakistan. Yesterday we looked at the first five of our top ten useful stooges of 2015. Here are the rest. Again, these aren’t necessarily the very worst creeps we’ve written about here; they’re just a few of the people whose stoogery during the last year stood out in ways that we thought made them worth another quick look before we move on into 2016. Stephen F. Cohen How could we leave Stephen F. Cohen out of this? He’s Putin’s most high-profile apologist, who – usually in league with his wife, moneyed Nation doyenne Katrina vanden Heuvel – keeps coming up with new ways to sell his hero in Moscow. In 2015, he co-founded the American Committee for East-West Accord, which pretends to promote “open, civilized, informed debate” on U.S.-Russian relations but, in the grand tradition of “committees” dedicated to U.S.-Soviet “peace,” “friendship,” and “understanding,” is patently nothing more or less than a pro-Kremlin propaganda operation. This is, after all, a dude who, in a June article, painted Ukraine’s leaders as savages and Putin as a gentle soul responding with restraint to their violent provocations. Robert Redford He’s directed movies crudely savaging capitalism (The Milagro Beanfield War) and lustily celebrating the despicable Maoists of the Weather Underground (The Company You Keep), and he produced The Motorcycle Diaries, a shameless hagiography of Che Guevara. In 2015 he played the lead role in Truth, one of the great cinematic falsehoods (and, fortunately, flops) in the entire history of Hollywood. Turning the facts of the 2004 Rathergate scandal upside down, the film transforms CBS Evening News anchorman Dan Rather – who lost his job for trying to sell the public on forged documents – into a hero who was fired for defending the truth. When this dreck was released in October, Redford, now 79, was out there promoting not only the picture but its profoundly mendacious message. Roger Waters For years, the former Pink Floyd front man has publicly compared Israel to Nazi Germany and severely chastized fellow celebrities for performing there. In 2013, his concerts featured “a pig-shaped balloon adorned with Jewish symbols, including a Star of David.” This October, in a particularly vicious open letter in Salon (where else? ), he told Bon Jovi that by accepting an invitation to Israel they were allying themselves with child-killers. Ignoring his demand that they change their mind about the trip, Bon Jovi went ahead with their plans and went onstage before a Tel Aviv audience of 50,000 only minutes after two people were killed in a Jerusalem terrorist attack. We’ve already written here about the head of Britain’s Labour Party, Jeremy Corbyn, who’s a fan of Hugo Chávez’s disastrous socialist “revolution” in Venezuela, and about the party’s recently appointed spokesman, Seumas Milne, who (to put it mildly) has a soft spot for Stalin. Abbott’s remarks outraged one of her Tory colleagues, Ian Bruce, who said: “I have never heard such racist rubbish from an MP in recent years….Most Finnish girls are dark-haired,” he noted, and all of the Nordic nations “have people from African and Caribbean countries living there.” The Royal College of Nursing reacted too, issuing a statement to the effect that Abbott’s comments seemed intended to “set nurse against nurse.” The story even made the news in Finland, where Katri Luukka, head of a nursing school in Helsinki, called Abbott’s statement “[r]eally thick, even for an MP.” The Spectator pointed out that some nursing trainees from Finland were, in fact, black, and that the then-reigning Miss Finland was also black. Well, let’s break that down. On her first point: yes, Mao led the Chinese from feudalism…to totalitarianism. On her second point: no, Mao didn’t help defeat the Japanese; Chiang Kai-shek and the Kuomintang did. Third, while Taiwan, under the Nationalist Chinese, was becoming a developed nation, the Chinese economy under Mao remained undeveloped. Even now, four decades after Mao’s death, when China is considered an economic powerhouse, its per capital GDP, at around $7,000, is still only a fraction of Taiwan’s, at $32,000. In short, Mao didn’t pave the way for his country’s economic success – his imposition of brutal totalitarian rule prevented his people from attaining Western-style prosperity. Of course, even if Abbott’s assertions about Mao’s supposed accomplishments were absolutely true, her belief that they somehow outweighed or legitimized or made up for his annihilation of tens of millions of his own people is reprehensible, and should have resulted in her immediate forced resignation from Parliament. But no: she’s still there, and seems to have no plans to leave anytime soon. Our subject this week has been Seumas Milne, Guardian columnist turned British Labour Party spokesman. Before we move on, a quick question: have you taken a good at his pictures? Yes, he’s handsome. But what about that look in his eyes? Is it just us, or – no, no, never mind. Anyway, on to our final couple of points. We’ve already witnessed Milne’s readiness to stand up for Stalin in the face of criticism. But it’s worth underscoring that he gets especially worked up whenever anyone dares to mention Stalin’s name in the same breath as Hitler’s. This is a thread that runs throughout his work, but two examples will have to suffice. No. But there was a deliberately engineered Ukrainian famine that took millions of lives; there was a policy of forced collectivization that also led to millions of deaths; and there was a national network of prisons, the Gulag, in which yet more millions perished. Unlike the Nazi death camps, the Gulag endured for decades; yet it has never received even a fraction of the attention in the West that has been devoted to Hitler’s atrocities. Example #2. In a 2009 piece reacting to Niall Ferguson’s statement that Stalin was “as much an aggressor as Hitler,” Milne again rushed to Stalin’s defense, insisting that “Soviet and Russian acknowledgment of Stalin’s crimes already goes far beyond…any such apologies by Britain or France for the crimes of colonialism” and fervently denying that “Soviet repression reached anything like the scale or depths of Nazi savagery – or that the postwar ‘enslavement’ of eastern Europe can be equated with wartime Nazi genocide.” As part of his effort to whitewash Stalin, Milne shamelessly smeared some of the nations Stalin subjugated – namely, Poland and the Baltic republics – as Nazi allies and collaborators. Enough. One last, unsavory detail: on top of everything else, Milne turns out to be a world-class hypocrite. While championing the public sector over the private, posing as a champion of working people, and cheering on totalitarian regimes that force “equality” on the proles at the point of a gun, Milne lives like any other man of privilege, luxuriating in a £2 million mansion in the exclusive London suburb of Richmond and sending his kids to a fancy private academy when there are at least four free public schools (note: we’re speaking American here) closer to home. How could you? How bloody could you? 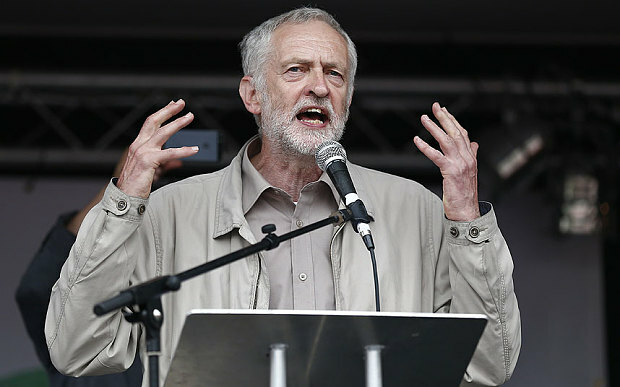 How could you appoint Seumas Milne to be your voice, your eyes, your hands?…Mr Corbyn, you say that you want to listen to us, the people; and then you pick Seumas Milne – the one journalist who always knows better than the people who were there….You pick a man who never heard an opinion that he didn’t filter; a truth that he didn’t dismiss as an orthodoxy, or a story of pain on which he didn’t have superior information. I’ve seen a bit bloody more than Mr Winchester-and-Balliol Milne. And yet, it is Seumas Milne who is the expert on foreign affairs. And although, somehow, his is always the foreign affairs of dictators misjudged, and chemical weapons unused — of pure ideology and never people. Yesterday we met Seumas Milne, a longtime Guardian writer and editor – and ardent apologist for Stalinism – who’s been tapped by Labour Party leader Jeremy Corbyn to be his spokesman. We’ve seen that his appointment appalled former Labour MP Tom Harris, who deplored Milne’s undisguised admiration for jihadists and lack of sympathy for the British soldiers they killed. Wherever there’s an aggrieved terrorist or an undemocratic regime engaged in an existential struggle with the West, you can rely on Seumas Milne, Oxford-educated warrior for the Third World and former comment editor of The Guardian, to offer a full-throated, if slightly incoherent, defense. If your country’s constitution mandates the burning down of orphanages and the conscription of 6-year-olds in to the army, Milne will likely have your back, provided you also express a deep loathing for the United States and capitalism. Moynihan quoted Milne on various subjects. The Soviet bloc: it “encompassed genuine idealism and commitment” to social justice. Meanwhile, in the Spectator, Alex Massie depicted Milne’s appointment as “consistent,” given Corbyn’s own admiration for Cuba and Venezuela, hatred of “American hegemony,” etc. If that’s where you’re coming from, asked Massie, why not pick a spokesman “whose back catalogue features defences of, or explanations and occasional justifications for, inter alia, Joe Stalin, Slobodan Milosevic, Iraqi Baathists attacking British troops, and much else besides”? Why not hire a guy whose published oeuvre “is stuffed with articles downplaying the horrors of Sovietism and then, latterly, redefining Russian aggression as defensive manoeuvres designed to combat – of course – western neoliberalism”? Massie quoted one of Milne’s many cockeyed statements about the USSR: “Whatever people thought about the Soviet Union and its allies and what was going on in those countries, there was a sense throughout the twentieth century that there were alternatives – socialist political alternatives.” Yes: alternatives that involved subjecting citizens to a culture of fear, denying them even a trace of individual liberty, imposing upon them policies of forced collectivization and planned famine that took millions of lives, and establishing a network of forced-labor camps to which millions of those citizens were sentenced for their political convictions or religious beliefs – or for no reason at all. Proudly powered by WordPress Theme: Scrawl.